Not to be confused with Neo-American Church. A peyote set such as this is used by the medicine man during the peyote ritual. Historically, many denominations of mainstream Christianity made attempts to convert Native Americans to Christianity in the Western Hemisphere. These efforts were partially successful, for many Native American tribes reflect Christian creed, including the Native American Church. Although conversion to Christianity was a slow process, the tenets of the Native American Church were more readily accepted. Originally formed in the state of Oklahoma, the Native American Church is monotheistic, believing in a supreme being, called the Great Spirit. The tenets of the Native American Church regard "peyote" as a sacred and holy sacrament and use it as a means to communicate with the Great Spirit (God). 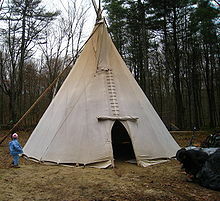 Followers of the Native American Church have differing ceremonies, celebrations, and ways of practicing their religion. For example, among the Teton, the Cross Fire group uses the Bible for sermons, which are rejected by the Half Moon followers, though they each teach a similar Christian morality. Ceremonies commonly last all night, beginning Saturday evening and ending early Sunday morning. Scripture reading, prayer, singing, and drumming are included. In general, the Native American Church believes in one supreme God, the Great Spirit. 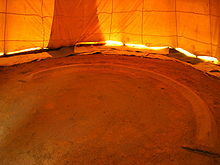 Ceremonies are generally held in a tipi and require a priest, pastor, or elder to conduct the service. The conductor is referred to as the Roadman. The Roadman is assisted by a Fireman, whose task is to care for the holy fireplace, being sure that it burns consistently all night. The Roadman may use a prayer staff, a beaded and feathered gourd, a small drum, cedar, and his eagle feather as a means for conducting services. The Roadman's wife or other female relative prepares four sacramental foods and the "second breakfast" that are part of the church services. Her part takes place very early, between 4:30 and 5:00 in the morning. The four sacramental foods are water, shredded beef or "sweet meat", corn mush, and some version of berry. To counterbalance the bitterness of the peyote consumed during the services, the sweet foods were added later. The second breakfast is like any other breakfast. It generally includes boiled eggs, toast, hash brown potatoes, coffee, and juice. This meal is served well after sunrise and just prior to the closing of the church services. Church services are not regular Sunday occurrences but are held in accordance with special requests by a family for celebrating a birthday, or for a memorial or funeral service. Services begin at sundown on either a Friday or Saturday evening and end at sunrise. Thus, a participant "sits up" all night, giving up a full night's rest as part of a small sacrifice to the Great and Holy Spirit and his Son. Common reasons for holding a service include: the desire to cure illness, birthday celebrations, Christian holidays, school graduations, and other significant life events. As the United States government became more involved in the control of drugs, the Native American Church faced possible legal issues regarding their use of the substance. The Indian Religious Freedom Act of 1978, also called the American Indian Religious Freedom Act, was passed to provide legal protection for the Church's use of peyote. The controversy over peyote resulted in its legal classification as a controlled drug. Thus, only card-carrying members of the Native American Church are allowed to transport, possess, and use peyote for religious purposes. The Neo-American Church tried to claim LSD and marijuana as sacraments, seeking protection similar to that afforded to peyote use by the Native American Church. The courts ruled against them. Quanah Parker is the individual most associated with the early history of Peyotism and the Native American Church. Other prominent figures in its development include Chevato, Jim Aton, John Wilson, and Jonathan Koshiway. These people, and many others, played important roles in the introduction and adoption of the Native American Church. ^ a b c d e Catherine Beyer. "Peyote and the Native American Church". About.com Religion & Spirituality. Retrieved 5 March 2015. ^ a b "Native American Church". Encyclopædia Britannica. Retrieved 5 March 2015. ^ "Native American Church". Retrieved 5 March 2015. ^ "World Religions & Spirituality - Native American Church". Archived from the original on 2 April 2015. Retrieved 5 March 2015. ^ "University of Virginia Library". Religiousmovements.lib.virginia.edu. 7 September 2006. Archived from the original on 14 December 2007. Retrieved 9 July 2011. ^ "'A Brief History of the Native American Church'". CSP. 1996. ^ a b c d e f "Encyclopedia of the Great Plains - NATIVE AMERICAN CHURCH". plainshumanities.unl.edu. Retrieved 28 June 2017. ^ a b "Native American Church - The Encyclopedia of Oklahoma History and Culture". www.okhistory.org. Retrieved 28 June 2017. Hayward, Robert. The Thirteenth Step: Ancient Solutions to the Contemporary Problems of Alcoholism and Addiction using the Timeless Wisdom of The Native American Church Ceremony. Native Son Publishers Inc., 2011. ISBN 0983638403. -- Describes the Native American Church Ceremony. Wikimedia Commons has media related to Native American Church. Swan, Daniel C. (2009). "Native American Church". Encyclopedia of Oklahoma History and Culture. Oklahoma Historical Society. Cowger, Thomas W. (2009). "Pan-Indian Movements". Encyclopedia of Oklahoma History and Culture. Oklahoma Historical Society. "Peyote Law". Native American Church. "Medicine Path Native American Church". Medicine Path. This page was last edited on 25 April 2019, at 23:07 (UTC).